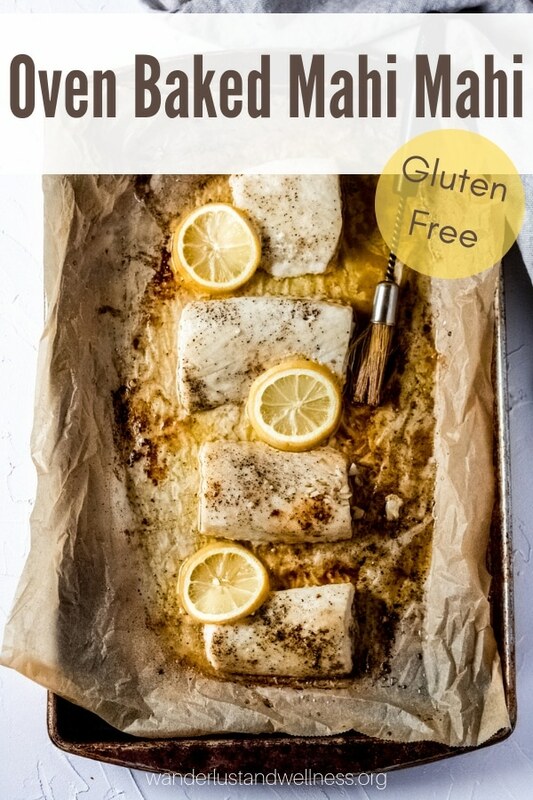 Sometimes you just need a quick and easy gluten-free dinner, and this Oven Baked Mahi Mahi is a perfect choice! In fact, many of our Mahi Mahi recipes can be fixed in under 30 minutes! Recently, we’ve swapped in Mahi Mahi for frozen fish sticks when we want a quick dinner – such a fresh option compared to those frozen fish sticks. And if lemon isn’t your favorite flavor – no problem – use your favorite fish seasoning instead! Growing up as a kid there was usually a weeknight dinner of fish sticks and macaroni and cheese. Even my own kids experienced this weeknight dinner – who else has this on their regular rotation?? Now, there’s nothing wrong with frozen fish sticks. There are quite a few decent selections out there; however, when I started looking at gluten-free options, I found that oven baked Mahi Mahi was a quick and easy choice and no worries about breading that contained gluten. What temperature should Mahi Mahi be cooked to? A quick way to test Mahi Mahi for doneness is to use a fork and see if it flakes easily. But, I can remember when I first started cooking fresh fish I did the fork test and still wasn’t sure if it was done. I wanted a little more piece of mind. If you’re like me, then checking the temperature with a meat thermometer is the way to go. Mahi Mahi should be cooked to around 137 degrees F. Be sure as to not overcook it – as it will dry out quickly. We get this question a lot – and the answer is really up to you and how you define healthy. Mahi Mahi is an excellent source of protein, vitamin B12, Niacin while also being low in total fat. Mahi Mahi has a very mild flavor profile which is why it’s a family favorite. It’s very similar to tilapia or cod. Can I cook Mahi Mahi frozen? Yes, you can cook your Mahi Mahi fillets frozen; however, I would recommend thawing first. To safely thaw the fish, place in the refrigerator the night before and let it gradually thaw overnight. Preheat oven to 425 degrees. F. Line a baking sheet with parchment paper, then spray with cooking spray or brush with olive oil. Then add the Mahi Mahi fillets to the baking sheet. Melt the butter, then add in the minced garlic and lemon juice – store to combine. Brush the lemon butter mixture over the raw Mahi Mahi fillets. Slice one lemon into thin slices, remove any seeds, and lay on top of the fillets. 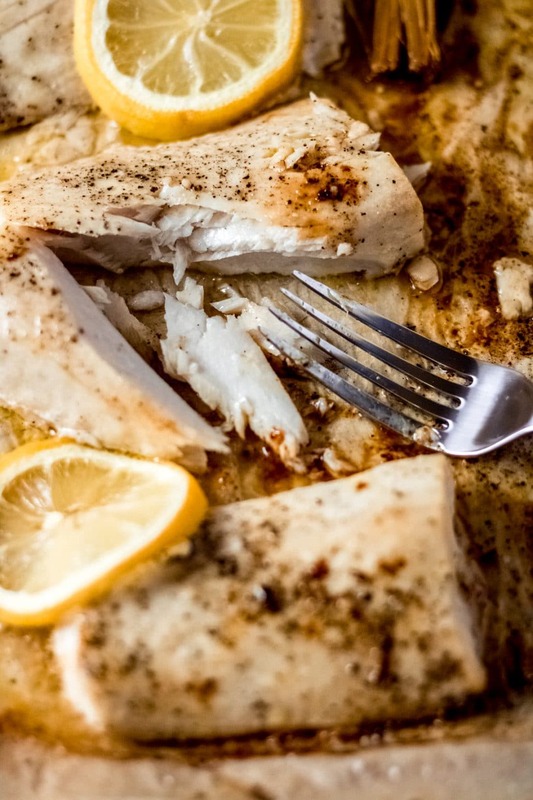 Place into the oven and bake for 20 minutes or until the fillets flake easily and/or reach an internal temperature of 137 degrees F. Remove from oven and brush the melted lemon butter from the pan over the fillets once again. Serve immediately. Enjoy these other Mahi Mahi recipes! 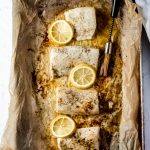 An easy 30-minute gluten-free dinner with this oven baked Mahi Mahi roasted with butter and lemon juice. Line a baking sheet with parchment paper, then grease the paper with cooking spray or brush with olive oil. 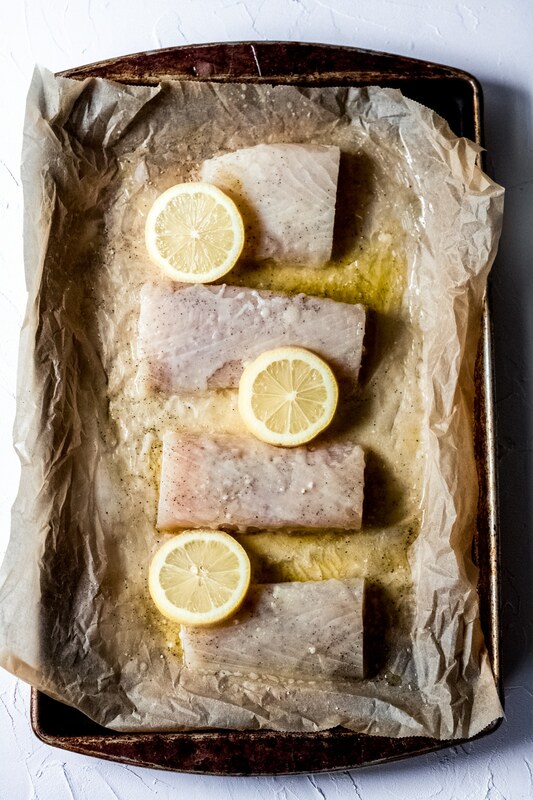 Place the thawed Mahi Mahi fillets onto the parchment paper. Season with salt and pepper. Melt the butter, then add in the minced garlic and lemon juice – stir to combine. 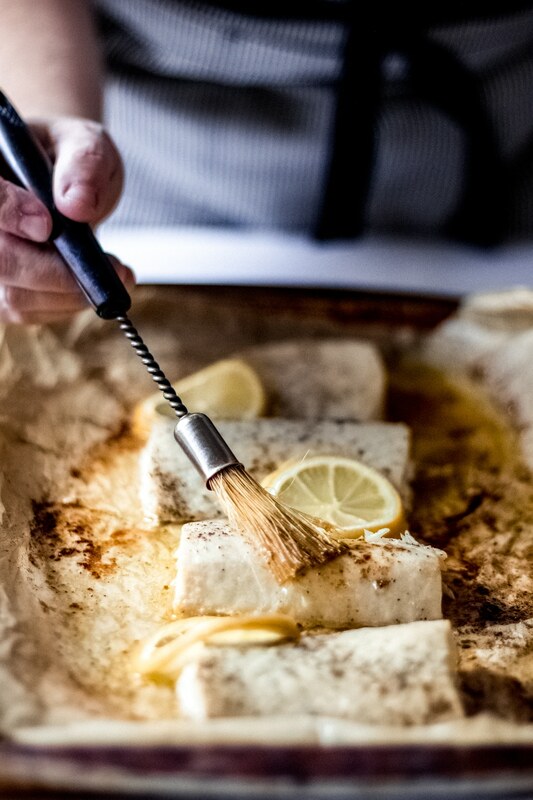 Using a basting brush, brush the lemon butter mixture over the Mahi Mahi fillets. Slice one lemon into thin slices, remove any seeds and place onto the fillets. Bake for 20 minutes or until the fillets are flaky and reach an internal temperature of 137 degrees F.
Remove from oven. Using the basting brush, brush the melted lemon butter from the pan over the fillets once again. Serve immediately. Be sure to thaw the Mahi Mahi fillets prior to baking. If you forget to thaw overnight, you can place the fillets into a resealable bag and place the bag into a bowl of cold water to thaw.